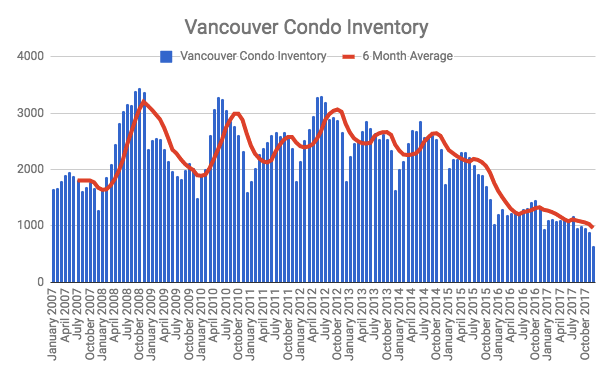 Vancouver condo inventory plummeted to new record lows in December. Despite that, price growth appears to have tapered. After a previous 11 straight monthly increases, the average price per square foot dipped for the second consecutive month in December to $1020. Vancouver condo sales increased 12% on a year over year basis. The 369 December sales were 7% above the 10 year average for the month of December. Surprisingly, the largest increase of sales came in the two bedroom segment. 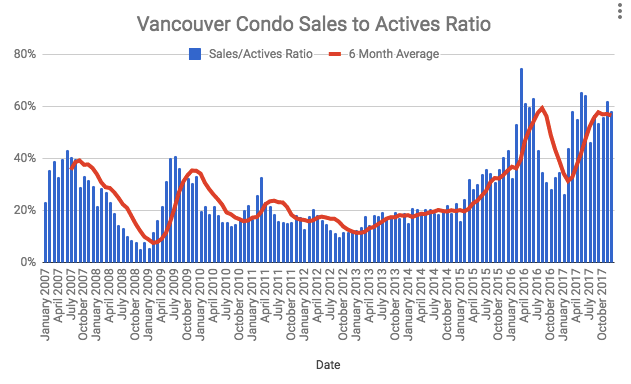 Vancouver condo sales on a 6 month moving average appear to trending downwards. 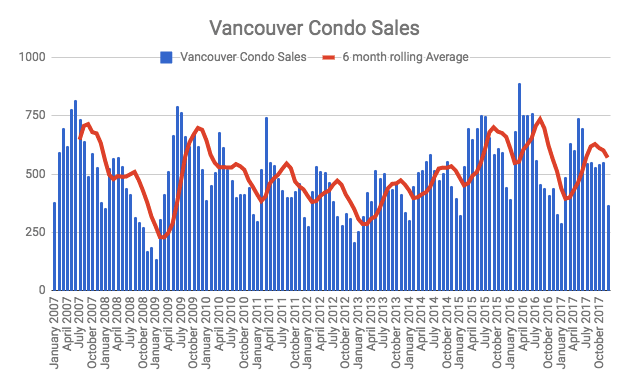 Vancouver condo sales and 6 month moving average. Vancouver condo new listings increased by a staggering 63% on a year over year basis. Not to be confused, this does not mean sellers are flooding the exits. New listings last year hit record lows so comparing the two can be quite misleading. Although, new listings were 6% above the 10 year average this December. Vancouver condo inventory hit new lows of 638 units for sale. This is the lowest total in recent history. Inventory levels continue to trend downwards. The sales to actives ratio was 58% in December, 2017. Indicative of a hot sellers market. The average sales price dipped for a second consecutive month in December to close out the year at $856,344 good for a 12.5% increase year over year. The median sales price was $719,000, a 16% increase year over year. The Vancouver condo market has seen prices slow in recent months. Much of this could be seasonal so we will have to keep an eye on prices in early 2018. Inventory remains at record low levels so it’s hard to see any real price relief coming to buyers anytime soon. However, a record 40,000 new units are under construction and I suspect that should provide some supply relief in 2018. We will also have to see how new mortgage stress test rules affect the market, but with buyers being able to lock in a pre approval for 120 days, you likely won’t see a noticeable impact until this summer.